Acellent Technologies Inc. and TESTIA GmbH are pleased to announce a collaboration between the companies via a Memorandum of Understanding (MOU) for installation, marketing and commercialization of Acellent’s Structural Health Monitoring (SHM) products. TESTIA, an Airbus company, is a leader in NDT services and quality services for aerospace and other industries in Germany, Europe and worldwide and is seeking to expand its range of SHM services that help to decrease the downtime of aircraft in service, enable predictive maintenance and reduce recurring maintenance costs. Acellent is a leader in the design, development, and manufacturing of Structural Health Monitoring (SHM) Systems and is looking to expand its marketing and distributor network for its Structural Health Monitoring products. 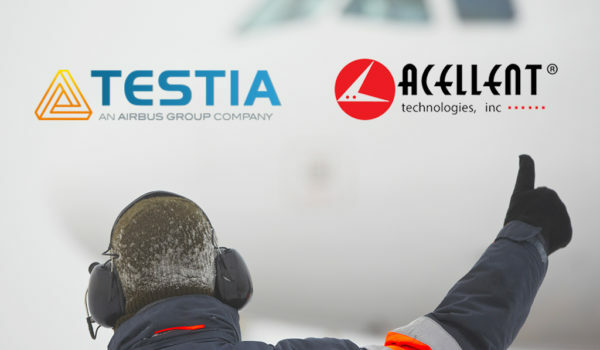 TESTIA is an AIRBUS company with over 25 years of experience in the field of Non-Destructive Testing, Quality Inspections, Testing and Training in Aerospace. Following an ambitious development plan driven by increasing customer demand, TESTIA has now established a presence in major countries and can serve its clients globally: France, UK, Germany, Spain, Singapore, South Africa, Mexico. Through its network, TESTIA provides worldwide services and a global solution to the industry needs. TESTIA offers a unique range of NDT services, NDT Inspection Equipment, Testing capabilities, Training and Smart Mobile Worker solutions (Augmented Reality systems, remote NDT solutions, etc. for quick and efficient analysis of structures, components, and assemblies. Acellent Technologies, Inc., headquartered in Sunnyvale, CA, in Silicon Valley was founded in 1999 based on Structural Health Monitoring technology developed at Stanford University. The company’s products are distinctively qualified to translate the condition of aging, degrading, and failing structures into a clear metric on the health of the structure. Acellent designs, manufacturers, and provides service and support for health and condition monitoring systems for diverse structures that include aircraft, rotorcraft, pipelines, bridges, wind turbines, and automobiles. Acellent’s products are sold and used by customers worldwide. More information on Acellent can be found at www.acellent.com.